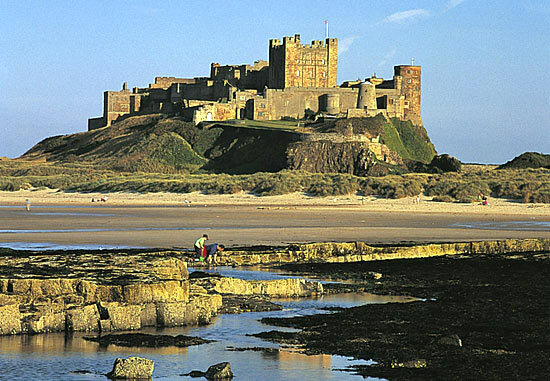 Did you know that Northumberland boasts more castles and fortified houses than any other English county? Many of these are open to visitors and make a great day out. One of the most photographed icons of the region is Lindisfarne Castle on the Holy Island of Lindisfarne and within a 15 minute drive, you can be greeted with the magnificent Bamburgh Castle with its links to Arthurian Legend and it’s very own dragon legend, the romantic cliff-top ruin of Dunstanburgh and not forgetting Alnwick Castle, the ancestral home of the Dukes of Northumberland and made famous as the location of Hogwarts in the Harry Potter films. Alnwick is also the location of the Alnwick Garden, open to the public every day except Christmas day. Here you will find the largest treehouse in Europe, a poison garden, a spectacular grand cascade and numerous other things to delight the green fingered can be greeted with the magnificent Bamburgh Castle with its links to Arthurian Legend and it’s very own dragon legend, the romantic cliff-top ruin of Dunstanburgh and not forgetting Alnwick Castle, the ancestral home of the Dukes of Northumberland and made famous as the location of Hogwarts in the Harry Potter movies. As well as things to see and visit, there are also plenty of things to do – angling, golf, walking, cycling and of course – bird spotting.